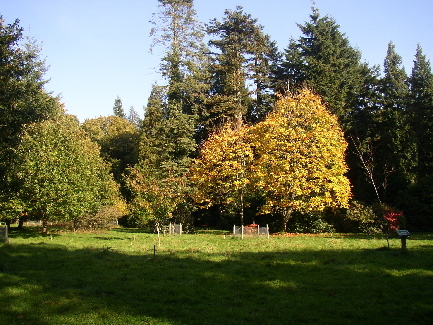 The arboretum is named after local historian and forestry expert, Dr Cyril Hart. 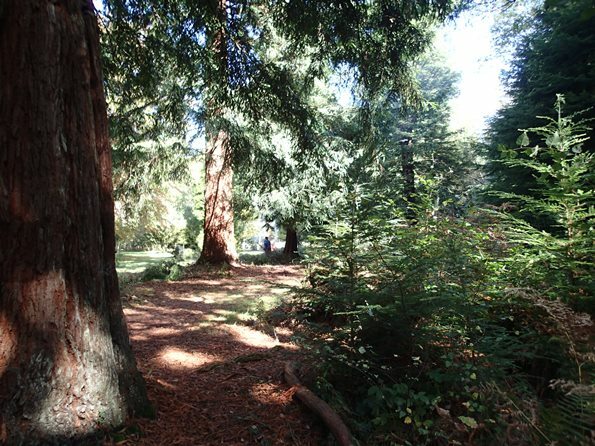 The collection started in 1910 and contains over 400 trees. 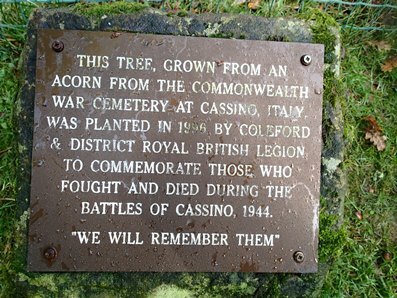 It is situated on the B4226 Coleford to Cinderford road close to the Speech House. Our last task here before Christmas, so we got a good fire going by removing the weed trees along the old wall at the back of the Arboretum. 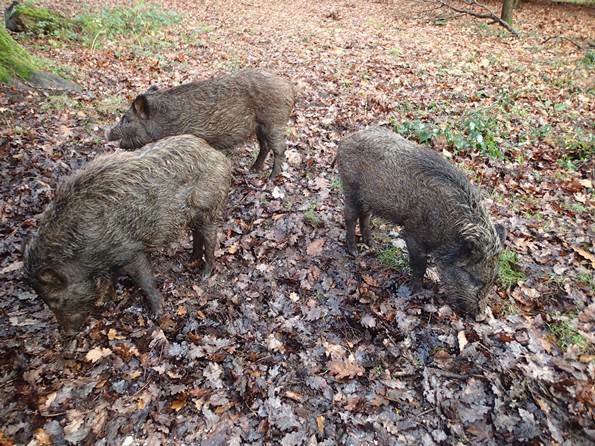 On arrival in the car park, there were 5 juvenile boar scuttling around and they were totally obivlious to us, dogs and the cars! They are incredibly tame and fearless (probably because they are being fed) so it is a worry that they will get knocked down by cars on the road. 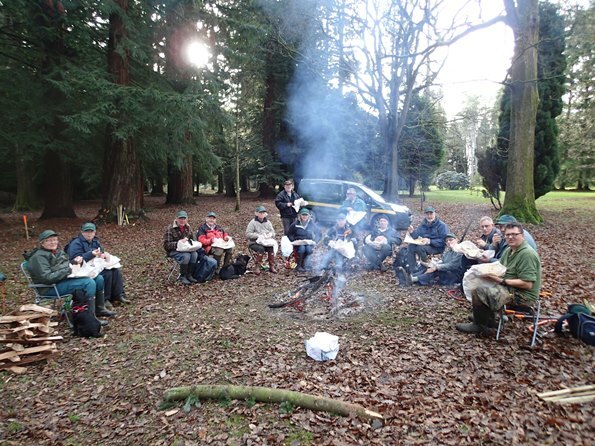 The team are enjoying their reward of fish and chips courtesy of the Forestry Commission as a thanks for their hard work during the year. 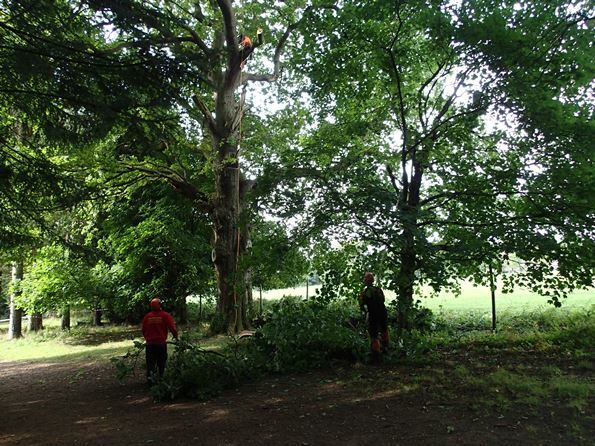 Continuing the clearing of fallen branches and removing small fir trees round the edges of the Arboretum. There is a regular boar visiting both car park gates at the Arboretum nicknamed Betty. The reason she is often there is that she is being fed. A beautiful, sunny autumn day in the Arboretum. Many branches to clear away and burn. We took off a lot of lower branches from some of the fir trees and found that they had rooted themselves under the trees which was causing the top of the trees to die off as the roots were soaking up all the water. Hopefully, this will solve that problem. 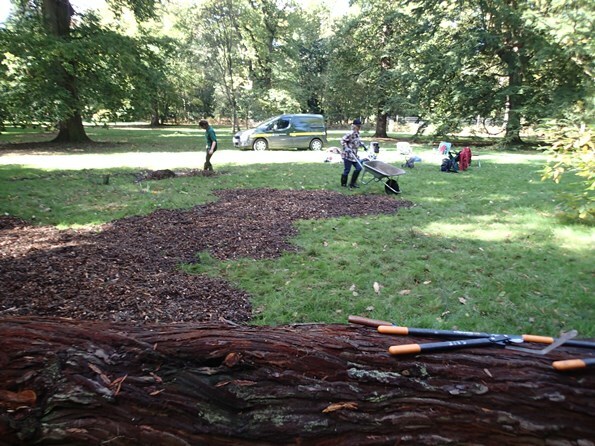 We also used the bark chippings from the fallen Redwood tree to cover and soak up some really boggy areas in the ground beside it. 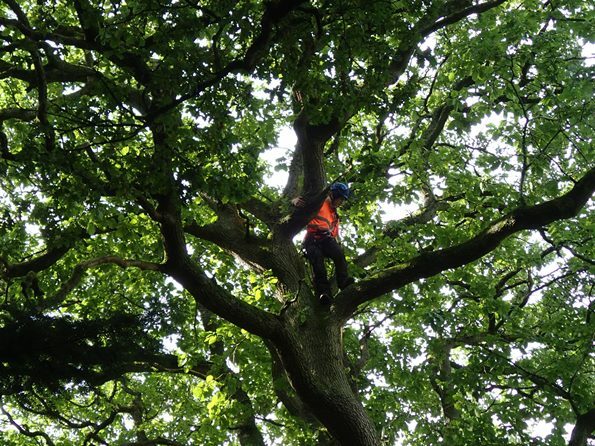 It is not often that we see a man up a tree but, today in the Arboretum, we needed experts to remove some large branches from this oak tree so that they would not fall on someone's head! 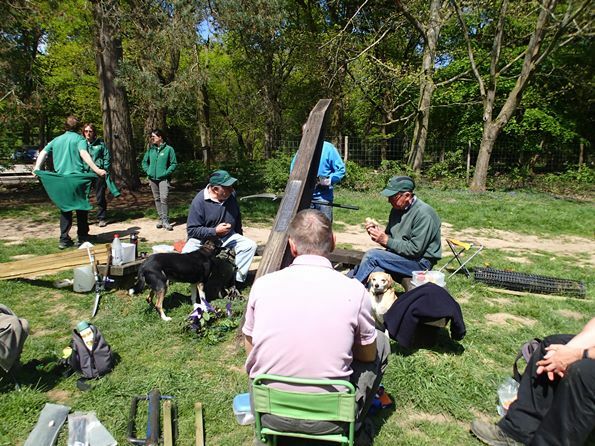 The volunteers cleared and burnt the branches and piled up the larger wood remains. 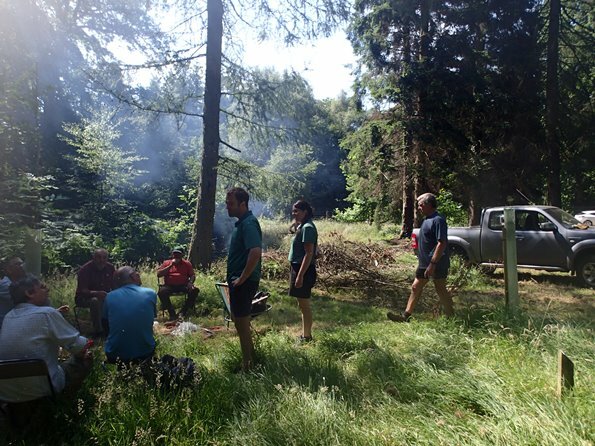 Unlike last month, we now had one of the heatwave days so the team were quite lethargic! We collected up and burnt all the cuttings from last month and took it easy! 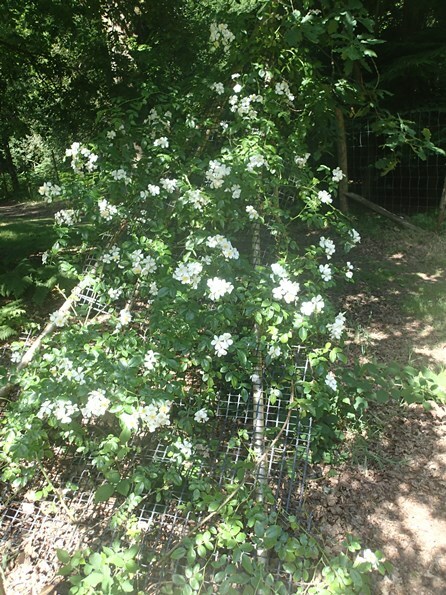 This is the Guelder Rose in full flower ( common name: dogberry; water elder; cramp bark; snowball tree; European cranberry bush). Guelder Rose is a spreading shrub. 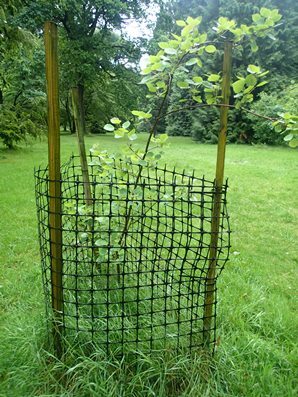 It can reach up to 4m high and can spread from 2-5m and we had previously built a netting support to encourage it to spread in the tree above.. 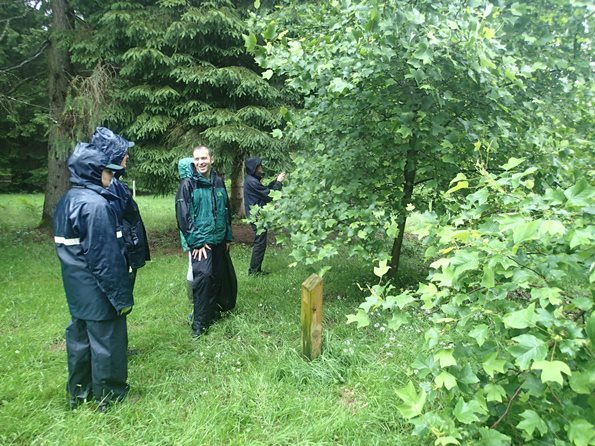 It was absolutely pouring down with rain but a few hardy souls came out to do some work in the Arboretum! 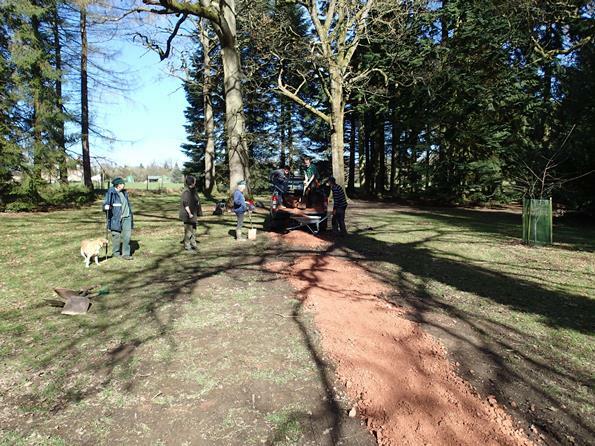 The pathways we had previously laid now have a softer, sandier surface on them. 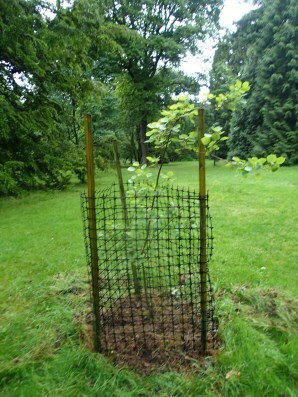 Lower branches of a few trees were trimmed off and a few of the netted enclosures were weeded. This is the soggy team by the Tulip trees. (Liriodendron tulipifera) is an unusual tree grown for its curiously shaped leaves and stately shape. It's common name, Tulip tree refers to the small, pale green tulip-shaped flowers which only appear on mature trees, usually over ten years old. One of the enclosures was totally submerged in bracken, loosestrife and bramble so these images show the before and after of our clearing. A lovely day and lots of jobs to do. The sundial was repainted with Linseed oil although the oil ran out quickly as the wood absolutely soaked it up! Many of the small circling enclosures around the young trees were raised so that we could pull out the long grass and weeds inside them. Fallen branches were burnt. A fungus ridden cherry tree had to be removed. The Bluebells are just coming in to full flower! Yes - even more path maintenance! 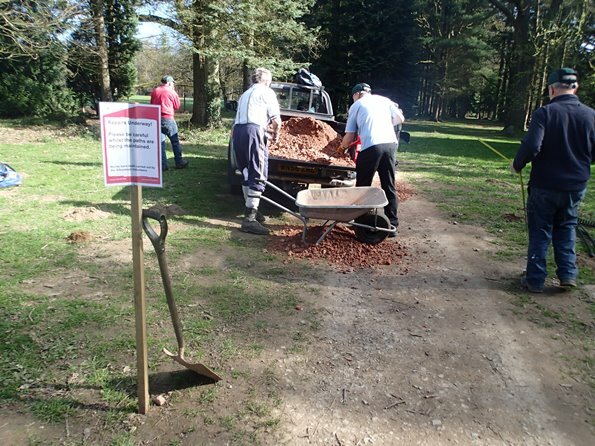 Apparently, the paths should be at least 1.2 metres wide and, as we still had a large pile of gravel to move we spent all day covering the tracks with it. 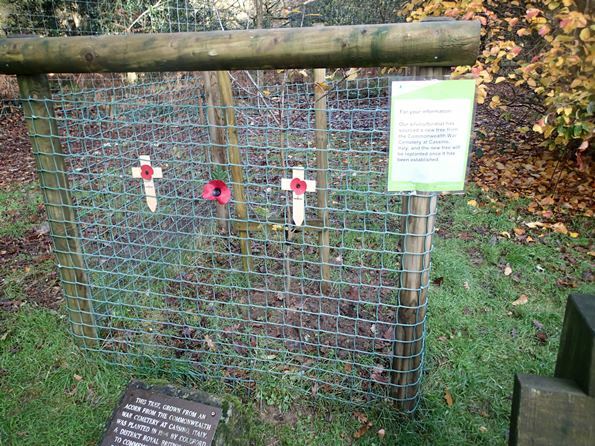 We also took out the larger stones to fill soggy patches in the Arboretum. It was a beautiful day which makes the hard work bearable! Spring is coming and the sun shone all day. 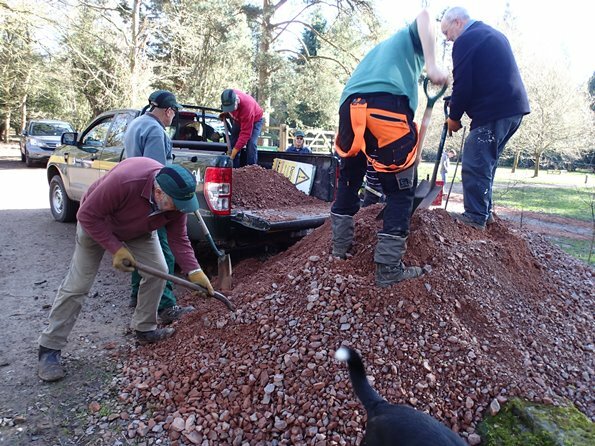 Our main task today was to distribute the gravel along the paths where the winter rains had made large puddles and churned up the muddy stretches. We concentrated on the harder tracks where a lot of people walk. The grassier areas will be tackled later in the year. We also pruned and burnt a lot of low growing branches. It was a beautiful, bright and frosty day. 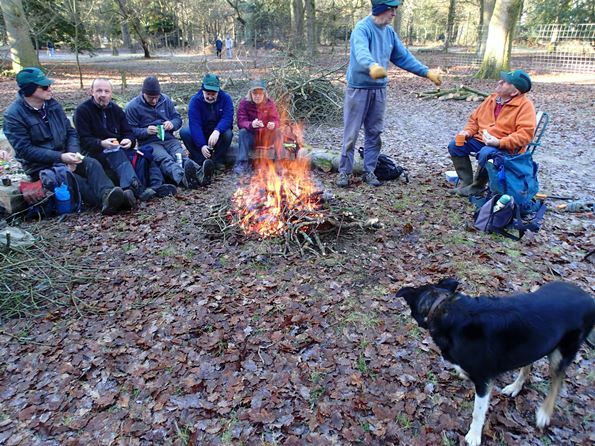 There was a Rowan tree growing with three split trunks but it had to come down as it was diseased on the top branches.The team are relaxing by the fire which we used to clear the smaller branches.